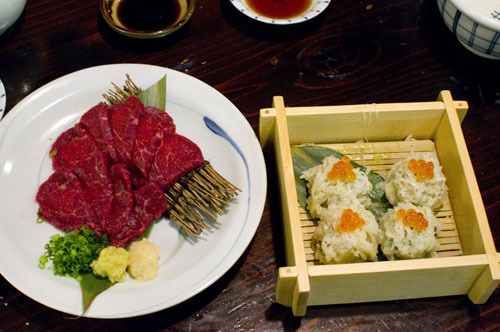 Gyossantei is a great place to sample the regional cooking of Miyazaki Prefecture, along with good sake from around the country. The dining space is comfortable and informal, and large windows on one side give it a spacious, open feel. Up front a quaint little counter displays the fresh produce of the day. 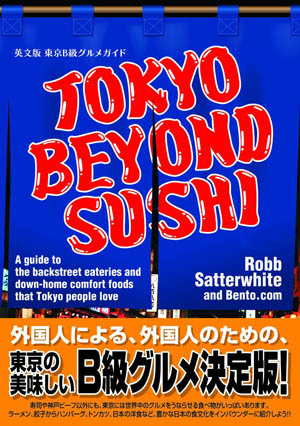 The extensive food menu provides a guided tour of Kyushu's most famous dishes. Miyazaki is renowned for its chickens, free-range birds with flavor and texture than their cage-raised counterparts. 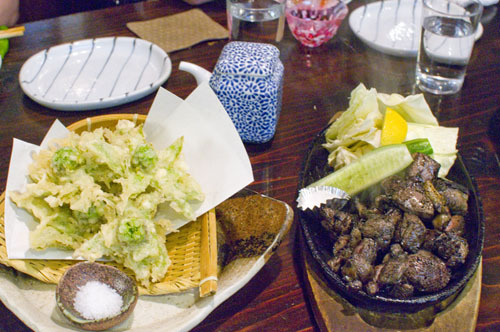 Gyossantei turns out commendable renditions of local dishes like chicken namban - deep-fried and juicy, slathered with the customary tartar sauce - and salted charcoal-grilled chicken with a rich smoky flavor and a pleasantly chewy consistency. Seasonal vegetable dishes are another strong point, and on a recent visit we enjoyed some very fresh-tasting corn tempura, winter melon in a tart ponzu sauce, and fantastic warabi (bracken fern) in a smoky broth. The light, fluffy tofu fritters (ganmodoki) are chock-full of mushrooms, carrots and scallions. There's also a very tasty version of buta-kakuni (braised pork belly). You can sample many other interesting local dishes - horsemeat sashimi, grilled dried fish, cold hiyajiru soybean paste soup - but if you don't want to work your way through the menu (which can be confusing if you're not familiar with Kyushu's culinary tradition) you can choose from two prix-fixe dinners (Y5300 and Y7400) that showcase the finest of Miyazaki cuisine. While the shochu selection is as thorough as what you'd expect from a Kyushu restaurant, there's also a very respectable sake selection from all over the country. Sake here is served in attractive bamboo containers, and you get to choose your own fancy glass sake cup with the first sake of the evening. 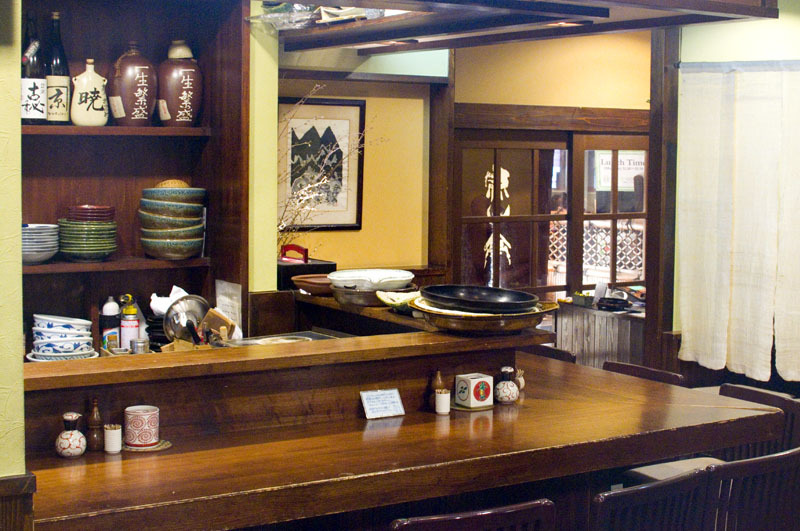 A bowl of ice-water is provided on the table with which you can rinse your cup whenever you change to a different sake. Shibuya-ku, Dogenzaka 2-23-12, Shibuya Fhontis Bldg 2F-A.